You run, you foam roll, you eat well and get enough sleep and of course, you stretch. Every part of your recovery routine is on point. And if you’re really up to speed with the latest recovery techniques, you know that dynamic stretches that move through a range of motion (as opposed to static stretches that you would hold for a number of seconds) are likely more beneficial for warming-up and cooling-down muscles before and after a workout. Karp explained that the best dynamic stretches work to contract the muscle group opposing the one that you’re stretching. He said that this allows the muscle you’re stretching to relax and therefore you’ll get a better stretch as your move the limb through its complete range of motion. When performing the following stretches, which Karp recommended specifically for runners, be sure to move actively through the range of each movement, “contracting the muscle group opposing the one you’re stretching,” Karp said. He also suggested using a rope or yoga strap for light assistance at the end of the range of motion for each stretch in order to increase how far you can move your limb. Lie on your back and bend your right knee, placing your hands behind your knee and thigh. Using your abdominals and hip flexors, lift your right leg toward your chest until you can go no farther. Gently assist your leg at the end of the stretch with your hands. Hold the stretch for one to two seconds, return to the starting position, and repeat five to ten times before switching to the other leg. Lie on your back with your right knee bent and your right foot flat on the ground. Make a loop with the rope and place your left foot into the loop, locking your knee so your left leg is extended straight out. From your hip and using your quadriceps, lift your left leg toward your chest, aiming your left foot toward the ceiling. Grasp the ends of the rope with both hands and slightly pull the rope toward you to assist at the end of the stretch. Hold the stretch for one to two seconds, return to the starting position, and repeat five to ten times before switching to the other leg. 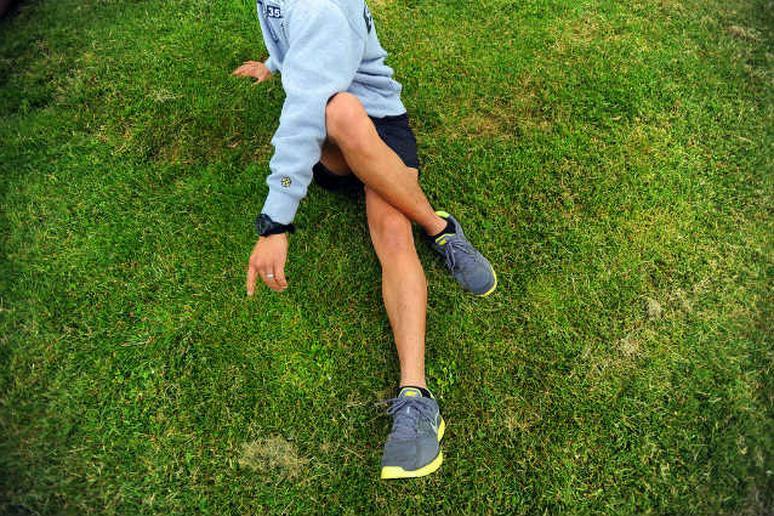 Click here to see more of the best stretches for runners.